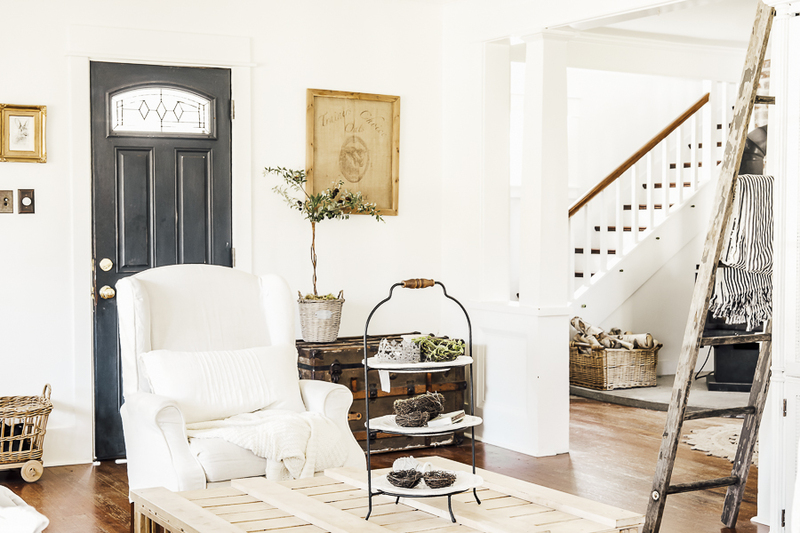 Once I get my porch set up for each new season, I move on to the living room to give it some new life. 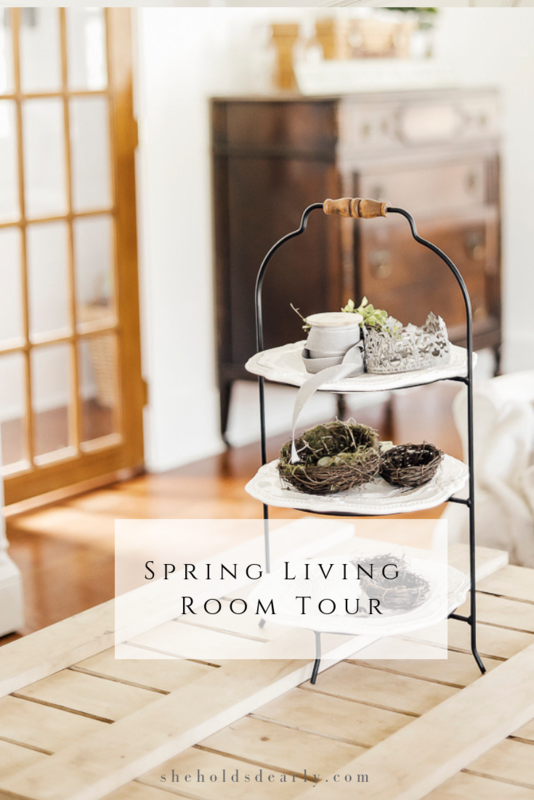 I’m excited to take you around on my Spring Living Room Tour today! 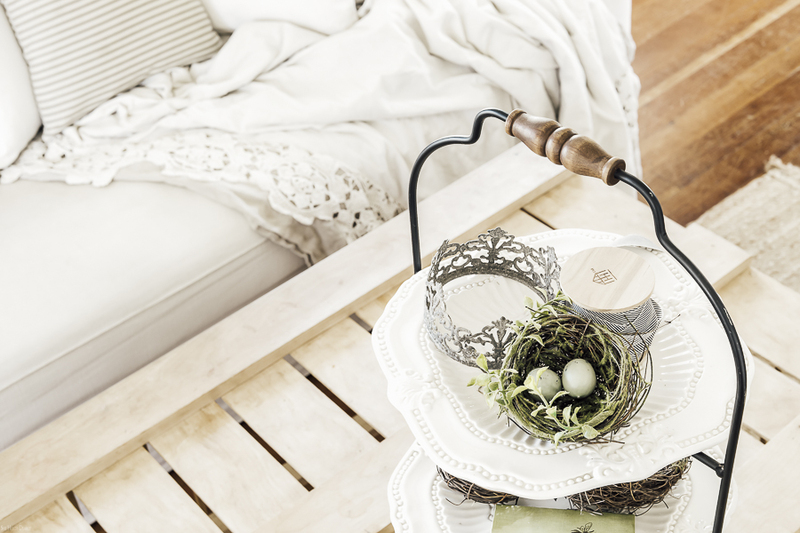 The easiest way to decorate seasonally is to break the room into zone and use them as focal points. Once this is done, I just switch up the fabrics a little and change some wall decor. A whole new, fresh look for the new season we are entering. 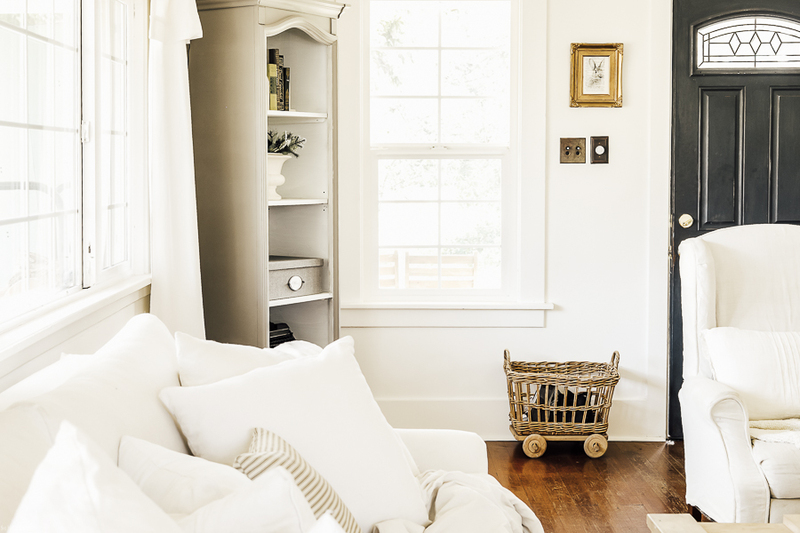 My zones/ focal points in this room are the piano (you might have a mantle instead), the dresser in the back corner and the coffee table. 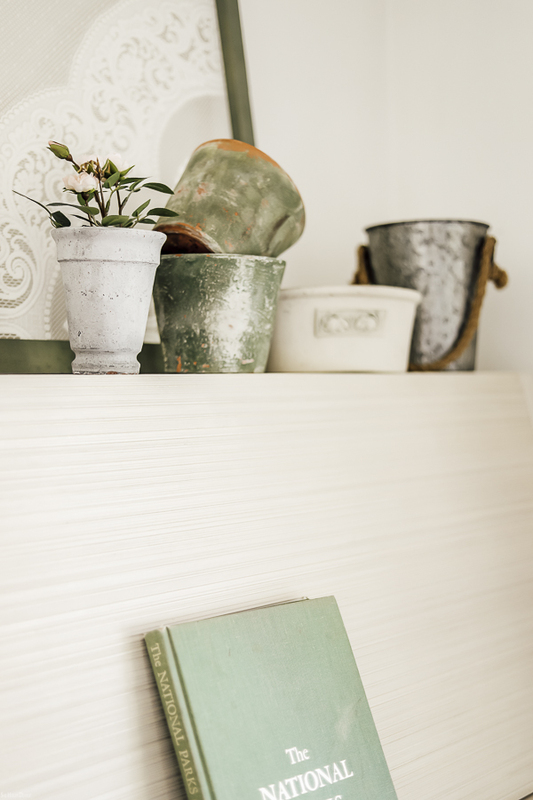 For the piano, I set up my largest vintage, green book for a pop of color and pulled out my lace window screen for up on top. Then, I just lined up some pots and gardening containers. The large, black tin with the seed packet image on it is from Tractor Supply, but is from last year’s line, so I don’t think you can find it now. The little rose bush is from Ikea for $3, y’all!!!! The dresser, affectionately referred to as the “Lego dresser” because this is were my son’s legos are stored, became a staging point for a faux spring picnic set up. *This post contains affiliate links to products I know &/or love. I set up a picnic basket with some glass bottles ($2 from Ikea), a cheese dome and glass cloche. The faux hydrangea is from Ikea, the As For Me and My House is from a past tutorial and the Fresh Flower sign was a gift. 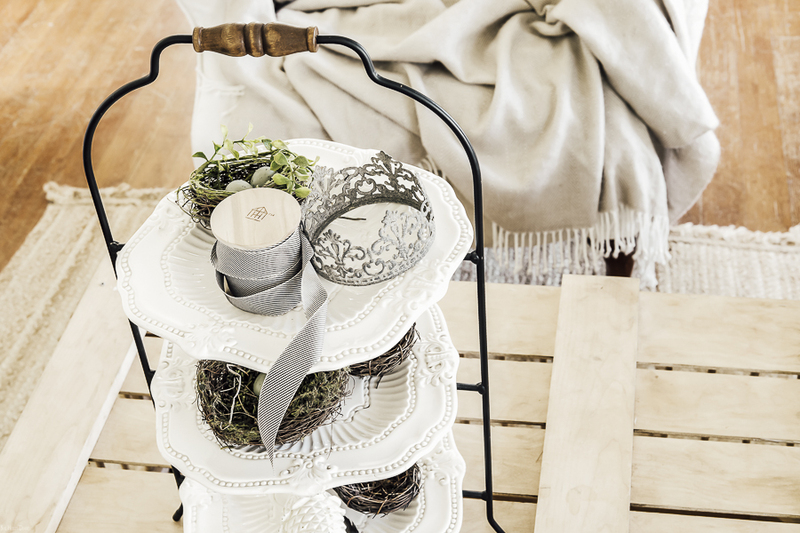 On the coffee table, I just set up my simple three tiered dessert stand with some birds nests, ribbon on a spool and some spring inspired pieces. 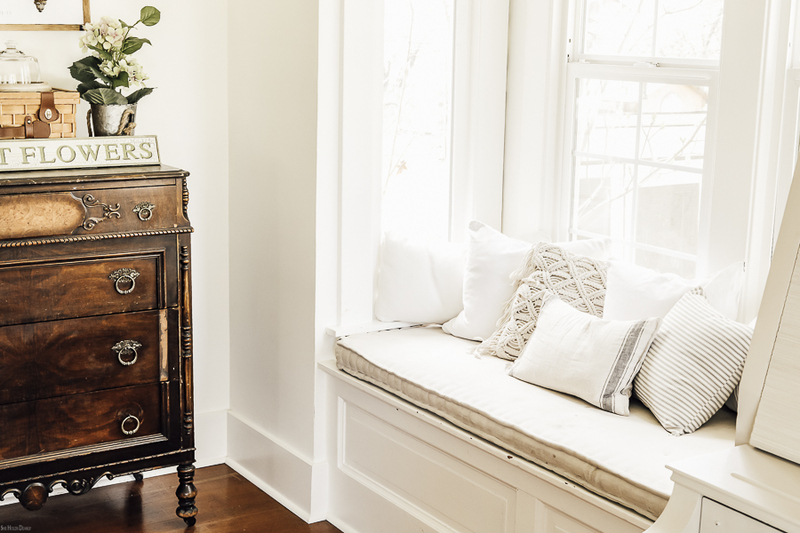 For the window seat, couches and wingback chairs, I just stuck with my regular style of whites and creams with lots of texture. 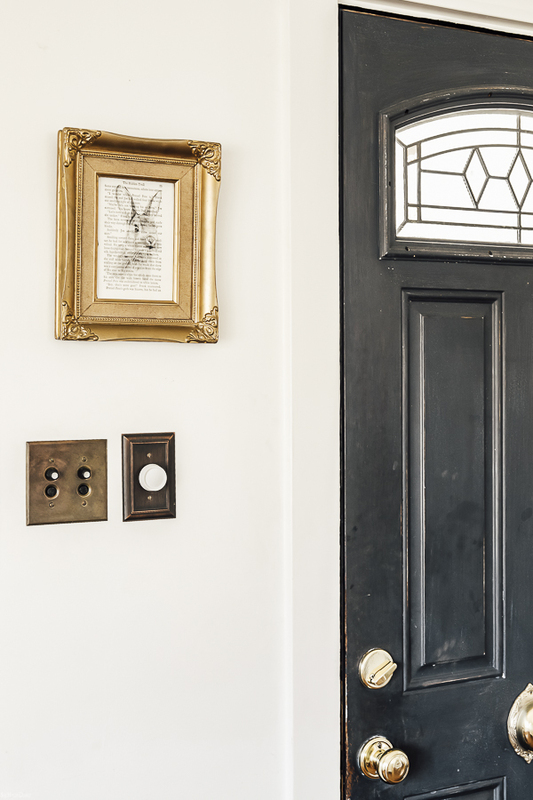 Next to the front door, I hung a framed book page with a rabbit sketch printed on it. And finally, above the couch, I simply printed a free bird printable from Pinterest and clipped it to a $1.50 clipboard. There is a hole on the clip part made just for hanging on a wall! Talk about easy! So, there you go, I hope you had as much fun touring as I did putting it together for you! 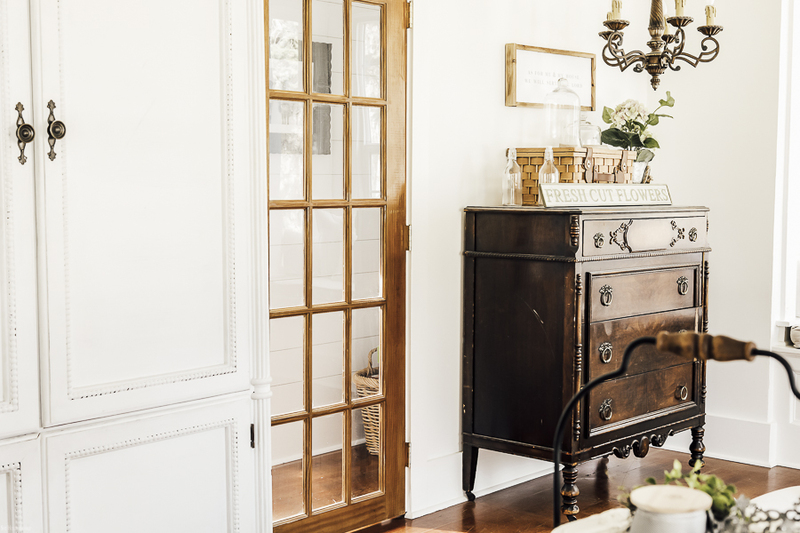 Thanks for stopping by our farmhouse and for visiting She Holds Dearly, all of your love and support for our decorating and remodeling endeavors make it that much more enjoyable! Watch this video to learn more! You can subscribe to my YouTube Channel here. I love you subtle touches of green for Spring! The vintage book on the piano is fabulous! 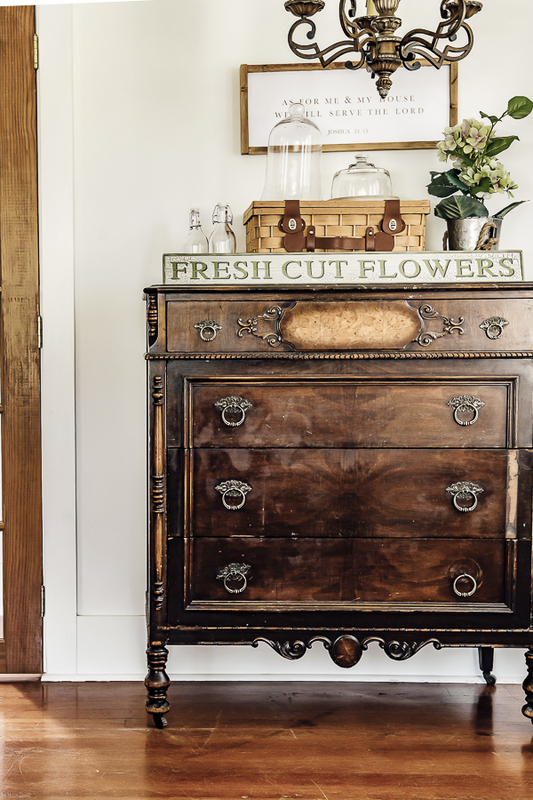 I, too, have a vintage four drawer dresser in my upper level living room. It was gifted to m by my son for Mother’s Day over 20 years ago. No Lego, just table linens and decorative tea towel storage! 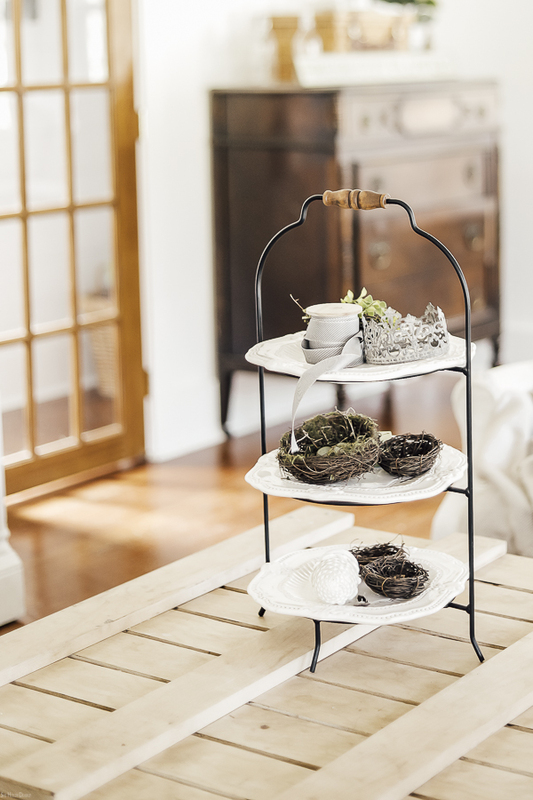 Love the nests on your three tiered storage rack! 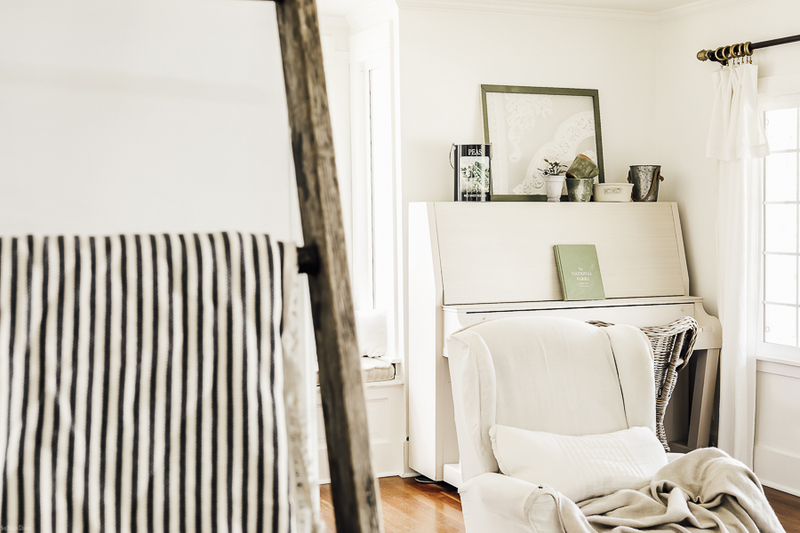 Thank you for sharing your lovely home and for always inspiring! I need to print some more art out. I just love how easy it is to change seasonally. Every detail is superb. Looks gorgeous! Well, hello there, my dear! My name is Sarah. I'm so glad you stopped by. 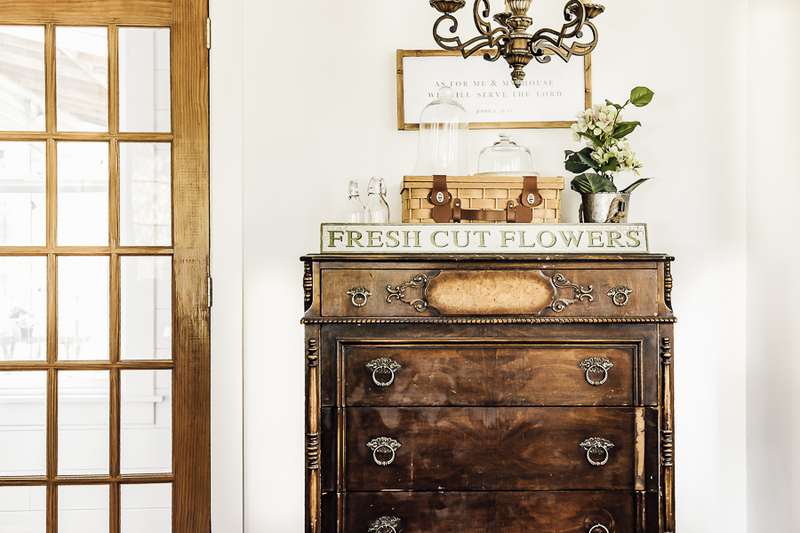 Let's talk farmhouses and vintage decor, shall we? © 2016-2019 She Holds Dearly. All Rights Reserved.